As you may know, my brother Steve, who inspired Pet-Friendly Francie, lived in Utah. He was also a big supporter of Best Friends Animal Society. And thanks to Best Friends Utah, animal lovers along with an entire coalition of animal welfare organizations have come together to make Utah a KIND and compassionate state. That means the entire state of Utah will end the killing of dogs and cats in shelters by NEXT YEAR! And their plan is working! They’ve already helped dozens of rescue animals find forever homes. Many of the 102 dogs and cats available met their new owners at the kick-off adoption last month. 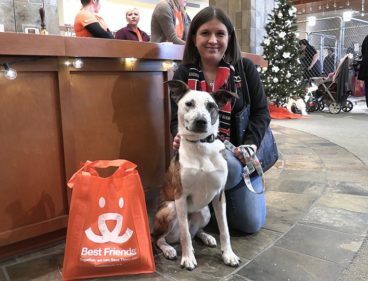 Cats and dogs from Community Animal Welfare Society (Utah’s oldest animal rescue), Rescue Rovers Dog Adoptions, Arctic Breed Rescue, Nuzzles & Co., Pet Samaritan Fund and Salt Lake County Animal Services met members of the public last month at the NKUT inaugural adoption event. If you live in Utah, or know somebody who does, please visit the NKUT Facebook page to find out about future events. And find your new Best Friend!